1932. A. & C. Black. Second. Signed by Sir B. Lovell. Hard Cover. Book-Good, gilt titles on spine, blue boards, spine sunned. 8.5x5.5. 105pp. 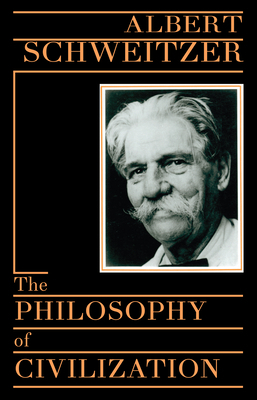 In this famous work, the missionary, theologian and philosopher, Albert Schweitzer, expands on his idea of the decay of Western civilization due to the abandonment of the affirmation of life as its ethical foundation. Very Good. Philosophy of Civilization by Schweitzer, Albert, 1987-03-01. Trade paperback (US). Glued binding. 346 p.
Fair. Signed by previous owner. The backstrip is creased and the head and tail are worn. the covers are rubbed and soiled. the edges of the text block are foxed. The interior is age-toned. the text is unmarked. 347p. Trade paperback. Index. 21 cm. Contains the author's The decay and the restoration of civilization and his Civilization and ethics, each originally published separately. Good. Tight, bright, creased spine, pages clear and bright, shelf and edge wear, corners bumped, packaged in cardboard box for shipment, tracking on U.S. orders.